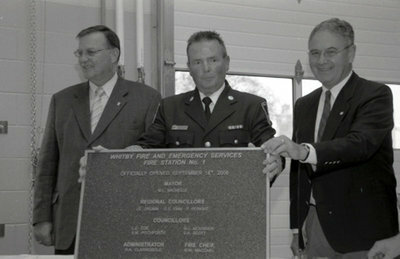 A black and white photograph of the plaque for the new Brooklin Fire Hall. In this photograph from left to right: Whitby Mayor Marcel Brunelle, Fire Chief Kent MacCarl and Regional Councillor Gerry Emm. Opening of the Brooklin Fire Hall, September 18, 2006, Carl Ferencz. Whitby Archives A2013_012_003A.